Friday was a BIG day for New York “Brass House” trio Too Many Zooz. Also known as Matt Doe, Leo P and Dave “King of Sludge” Parks. 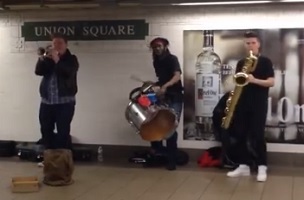 At one end, their January video of a rip-roaring Union Square subway station performance hit the front page of Reddit. At the other, they were thanking Jimmy Fallon’s band leader Questlove for having followed them on Twitter. The Questlove follow has fueled a campaign by some fans to get the trio noticed and booked by Fallon. Along with today’s warmer weather, nothing will get you into the jiggy spirit of early spring quite like the above nine-minute number that is one part Stomp, two parts New Orleans parade band and seven parts fan-ZOOZ-tastic.